Male Polynema, photographed by M. J. Hatfield. 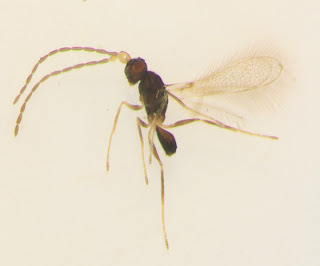 The Mymarini are a group of wasps in the Mymaridae characterised by four-segmented tarsi, and an abdomen that is convexly rounded at the base and lacking a phragma (Girault 1929). [G17a] Girault, A. A. 1917a. Descriptiones stellarum novarum. Privately published (reprinted Gordh, G., A. S. Menke, E. C. Dahms & J. C. Hall. 1979. The privately printed papers of A. A. Girault. Memoirs of the American Entomological Institute 28: 80-101). [G17c] Girault, A. A. 1917c. Chalcidoidea nova Marilandensis. III. Privately published (reprinted Gordh, G., A. S. Menke, E. C. Dahms & J. C. Hall. 1979. The privately printed papers of A. A. Girault. Memoirs of the American Entomological Institute 28: 132-137).